What are your favourite colours to wear during Autumn/Winter? Mines are definitely neutrals like browns, beiges, greens etc... so I had to put this outfit together to give ya'll some inspiration! Lately it's been rather cold outside and wearing normal bodycon dresses seems like an absolute myth to me,. So what do you do if you're heading out to a special event for example? 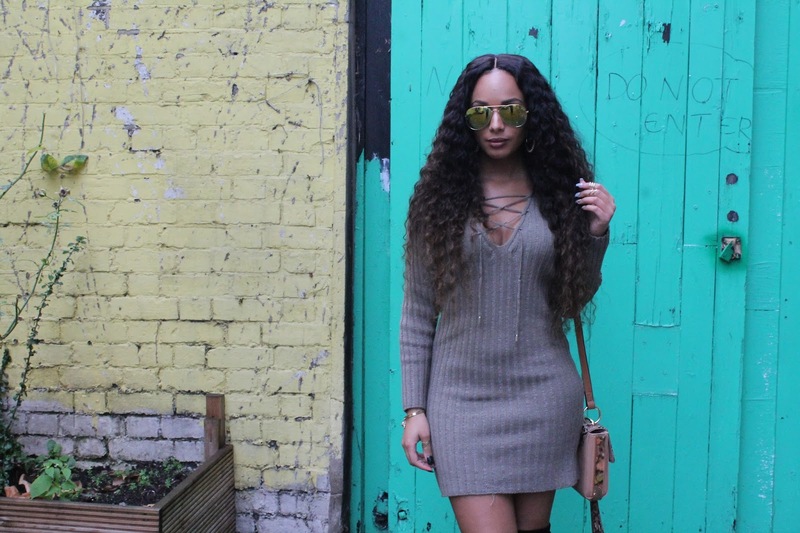 Invest in a knitted bodycon! 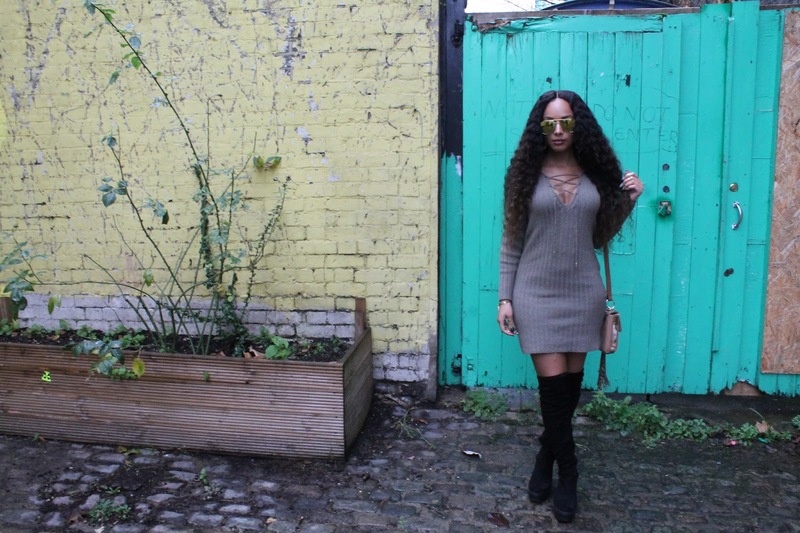 This one by Pretty Little Thing is surprisingly warm although you are not completely covered up and is just as stylish as any other normal bodycon. This dress can be dressed slightly down as I've done above with over the knee boots or can be dressed up with strappy heels and a clutch - which will compliment the lace up detailing! Purchase here for £20 (I'm wearing a size 8). Let's talk shoes and accessories! So I've featured these boots a few times on my blog... They're my absolute favourite and probably my most worn shoes of the year! They're from Schuh but can be purchased for much cheaper on sites like La Moda or Boohoo (sssh our secret). I have to say these ones are really comfortable, I can wear them to my meetings, lunches and several events in a day without any problems so definitely recommend them. If you're familiar here on my blog you would have seen this bag featured in my Black Friday deals post which can be found here. How many of you managed to grab this bargain? It's such a beauty! Last but not least, this badass Ladies Khaki Bomber Jacket is from Boohoo which perfects any simple outfit/adds an edgy twist. Typically, bombers look great with converses as well as cleated boots and even strappy heels! Great post! I have a few knit dresses that I recently purchased and I'm dying to wear them.